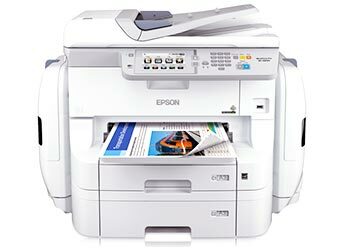 This breakthrough business printer features Epson’s Replaceable Ink Pack System (RIPS) to deliver super-high-yield printing. With this A3+ workgroup printer, offices can benefit from the increased productivity of a local distributed print fleet that requires minimal intervention while providing predictable print costs. PrecisionCore technology powers the output quality that Epson is known for, at the speeds required for office, commercial and industrial printing. Prints dry fast thanks to the DURABrite Pro ink. PDL printing emulations help this printer easily integrate into business environments. A smartphone-like 12.7cm colour touchscreen is easy to use, while scan-to functions and LDAP address book compatibility make it ideal for any office to share documents. Users can also securely print using a PIN code to release confidential documents. Print up to 75,000 pages in both black and colour without replacing the ink thanks to super-high-yield ink supply units. The WF-R8590DTWF uses up to 80 percent less power than competitive colour lasers thanks to its no heat technology. No ozone gas is emitted, and an improved quiet print mode and no fan noise during or after printing make it ideal for the working environment. And there are fewer parts to replace than a laser.